I love trying new recipes to bring to parties! 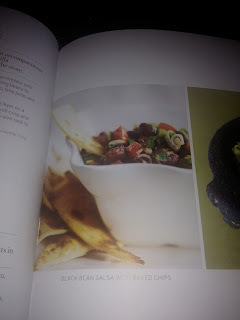 This appetizer caught my eye while I was flipping through my new "Power Foods" recipe book! Very easy and delicious! We were too excited to try it, that we did not even take a photo ... The one in the book will have to do! Heat broiler. Pulse ¼ cup of black beans in a food processor until coarsely chopped; transfer to a bowl. Add remaining beans to bowl, along with the tomato, scallions, jalapeno, cilantro, lime juice, and ½ teaspoon salt. Combine. Cut each tortilla into 8 wedges. Arrange in single layer on a baking sheet; brush with oil, dividing evenly. Broil until crisp and golden brown, 1-2 minutes per side. Transfer chips to a wire rack to cool. Serve with salsa.